Two new beatsticks that gain Power based on your G Zone when they Stand. 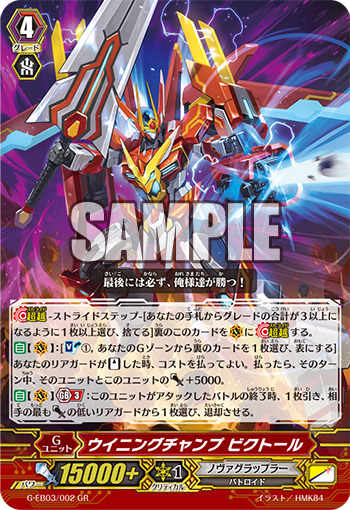 ACT (RC) 1/Turn Generation Break 1: [Rest this Unit] Choose up to 5 of your Rearguards, during that turn, they gain “CONT (RC): Resist”. Rush – AUTO (RC) 1/Turn: When this Unit Stands due to your card’s effect, for each face-up card in your G Zone, during this turn, this Unit gains Power+4000. 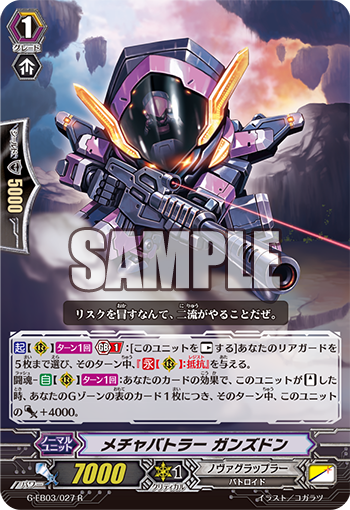 Rush – AUTO (RC) 1/Turn: When this card Stands due to your card’s effect, for each face-up card in your G Zone, during that turn, this Unit gains Power+5000.